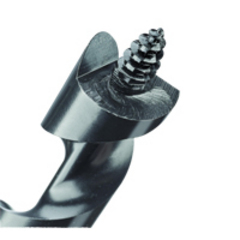 Fastest and Cleanest Drilling Pole Bit Available! These bits will outperform all other pole bits in speed and performance. Rugged heat treated bits with proprietary flute design, self-feeding screw and cutting spur, will cut through even the hardest treated wood poles with ease and will decrease average drilling times by 50%. Cuts a clean smooth hole. Bits come in a variety of diameters, an 18" and 24" length, and have a 7/16" hex shank. Please note: We strive to keep a variety of sizes on hand and ready to ship, but occasionally encounter material delays, which can impact lead times. Size 7/16" x 18"9/16" x 18"11/16" x 18"13/16" x 18"7/8" x 18"15/16" x 18"1" x 18"1-1/16" x 18"1-1/8" x 18"1-1/4" x 18"1-1/2" x 18"11/16" x 24"13/16" x 24"7/8" x 24"15/16" x 24"1" x 24"1-1/16" x 24"1-1/8" x 24"1-1/4" x 24"1-3/8" x 24"1-1/2" x 24"13/16" x 30"